When it comes to wrestling games I’m a fan of booking sims over wrestling sims. Those are the games where you take control of an organization and its roster and basically setup cards (the collective of matches, interviews, and other segments that make up a show) while competing against other promotions. 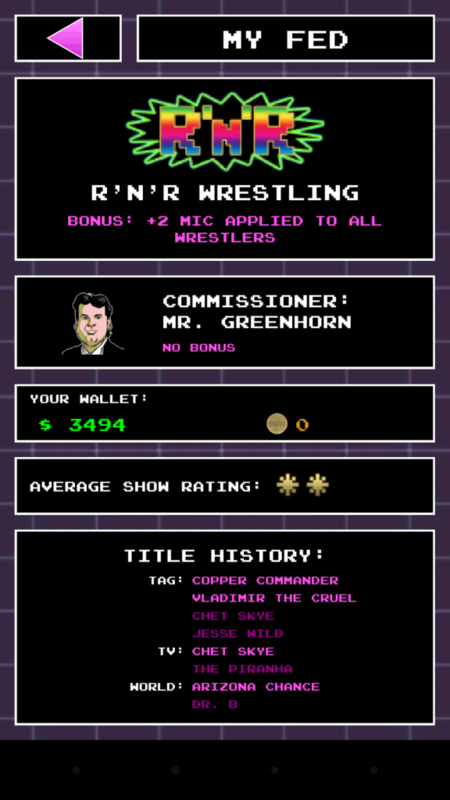 Checkmate Creative LLC’s 80’s Mania Wrestling (iOS) is pretty much the same thing. While not as deep as some wrestling sims such as Adam Ryland’s PC-based Total Extreme Wrestling or some games you can find on mobile app stores, this is an extremely fun and simple sim with a great concept and old school art style. Using 1980’s pop culture and wrestlers of the 80s as inspiration for the character cards in 80’s Mania Wrestling, there’s an interesting game world with tag teams and feuds. Additional cards make up these feuds, tag teams, merchandise, skits, interviews, venues, show sponsors, and match types all of which contribute to match and card ratings. The character cards can be improved with use depending on the segment—match or skit/interviews—and the character’s style determines how good it performs in that segments (along with the stats on the card for skill, popularity, push, and microphone skills). Like trading cards, the cards for the characters come in regular and two kinds of foil forms with main eventers being gold and higher in level for the stats and regular cards being curtain jerkers (lower in talents). There are also hologram-style cards. After leveling up cards to the max players can get merchandise. As for the actual booking part of the game, you have four cards to book a month throughout the 1980s. The first is an all match show, the second is more of a major TV show with matches and segments with the third and fourth cards (the pay-per-view) being the same as the second. Players get in-game cash for their shows as well as additional funds from adding a sponsor to a match. The better the show put together, the more money players pick up. From there players can buy new cards in the shop. At the completion of a year players get extra cards and a token which can be used to change the selection cards in the store or add $100,000 in-game cash to buy cards. Players can also buy more coins with real world currency.